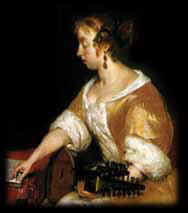 Gerard Ter Borch: 1617-81, Dutch genre and portrait painter. He portrayed the life of the wealthy Dutch burgher class in elegant and serene paintings. 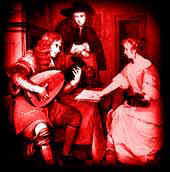 His most famous pictures include The Guitar Lesson (National Gall., London) and the celebrated group portrait The Peace of Münster (1648; National Gall., London). 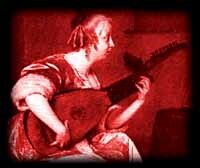 painting by G. Terboc in a book "String instruments of the Middle Ages" by H. Panum. All of the theorboe's I found have a" straight head" kinda like a fender where the head has a "jog" in it then it keeps going strait. 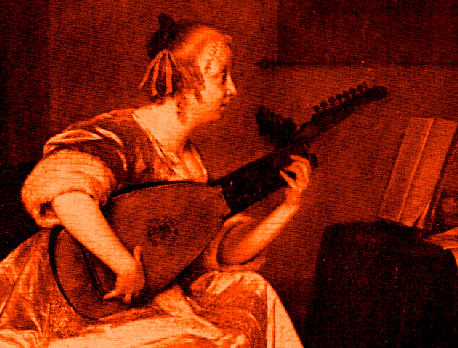 Lute's on the other hand have a head that is close to 90 degrees from the fingerboard and here's the clincher - the instrument in the painting "the lute player" is identified as a "Theorbo-Lute" & it has BOTH characteristics: a head like a theorbo and a head like a lute.